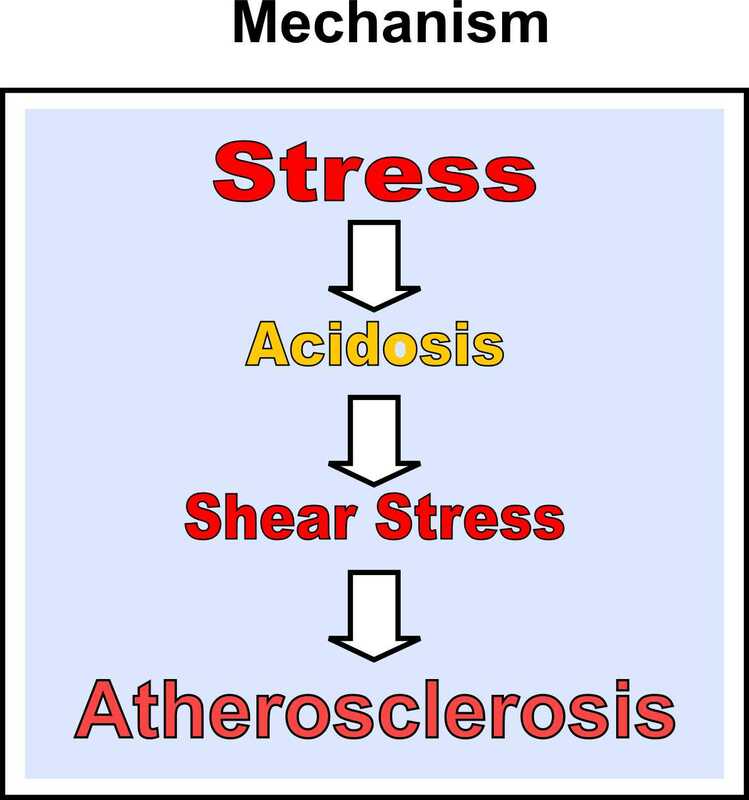 New Evidences: Acidity Theory of Atherosclerosis: Lactic acid elevation: the link between rheumatoid arthritis and atherosclerosis? Lactic acid elevation: the link between rheumatoid arthritis and atherosclerosis? Rheumatoid arthritis (RA) is considered a systemic autoimmune disease. However, what triggers the onset of rheumatoid arthritis still unknown. Patients with RA have a high prevalence of preclinical atherosclerosis independent of traditional risk factors, suggesting that chronic inflammation, and, possibly, disease severity are atherogenic in this population (1). Regarding this matter an editorial published at Circulation Journal in 1999 have discussed about the many similarities shared by RA and atherosclerosis (2). Recent investigations found that the atherosclerotic process begins very early in the course of rheumatoid arthritis with the study revealing a significant increase in intima-media thickness, an indicator of atherosclerosis, in just 18 months (3). Studying about the matter we have looked for studies investigating cardiovascular autonomic dysfunction in rheumatic diseases. Although there are few studies in this direction, we have noticed that the sympathetic nervous system activity may be elevated in RA compared with health patients (5, 6). According our view the sympathetic predominance is the primary factor in the cascade of events leading to increased lactic acid and acidic environment generating atherogenesis (7, 8). Also, we have discovered a study from the eighties showing high values of lactate in seropositive RA and crystal-induced arthritis, with the author suggesting that synovial lactate measurement could be a reliable indicator for differentiating inflammatory arthritides (9). In parallel, the amount of lactate released by the myocardium has been shown to be related to the severity of coronary artery disease (10, 11). “In 1858 Richardson published the results of extensive experiments on dogs in which the injection of large quantities of lactic acid, intraperitoneally, was followed by severe joint involvement. The condition of the joints was similar to that seen in acute arthritis, and Richardson suggested that the arthritic syndrome was due to an accumulation of lactic acid in the body. This theory found further support in 1877, when Foster reported that the administration of lactic acid by mouth to two diabetic patients resulted in painful and swollen joints. The pain and swelling persisted as long as the lactic acid administration was continued and disappeared promptly after the acid was discontinued. These early experiments were apparently never repeated or extended but they have exerted some influence in the formation of hypotheses regarding the disease”. This paper from 1924 strengthen our thoughts placed in the article “Old experiments with rabbits and dogs provide powerful evidence for the Acidity Theory of Atherosclerosis” where was shown that acid-fed rabbits and dogs may develop atherosclerotic lesions (13). 4. Holmqvist M. E. et al. Rapid increase in myocardial infarction risk following diagnosis of rheumatoid arthritis amongst patients diagnosed between 1995 and 2006”, J Intern Med 2010; 268:578-585. 5. Aydemir , V. Yazisiz et al. Cardiac autonomic profile in rheumatoid arthritis and systemic lupus erythematosus. Lupus (2010) 19, 255—261. 6. Dekkers JC et al. Elevated sympathetic nervous system activity in patients with recently diagnosed rheumatoid arthritis with active disease. Clin Exp Rheumatol. 2004 Jan-Feb;22(1):63-70. 9. Gobelet C and Gerster J. C. Synovial fluid lactate levels in septic and non-septic arthritides. Annals of the Rheumatic diseases, 1984, 43, 742-745. 12. F . A Cajori et al. The alleged role of lactic acid in arthritis and rheumatoid conditions. Arch Intern Med. 1924;34(4):566-572.